The celebrated Salman Rushdie has won almost all the best prizes, including long-legged, paparazzi-haunted models. But not the Nobel Prize for Literature. (French writer Modiano won it this year, prompting wags to say that anything with Modi is a surefire winner.) In 2012, since the publication of the fatwa-centric Joseph Anton, the literary world has been expecting the Stockholm Syndrome for Rushdie. The Nobel committee, however, had already clarified in 1997 that giving him a Nobel would be ‘too predictable, too popular’. Elvis has left the building. Hence it was a predictable but a popular decision to award child rights activist Kailash Satyarthi, and Malala Yousafzai, the Pakistani teenager who was shot at by Taliban gunmen, the 2014 Nobel Peace Prize. 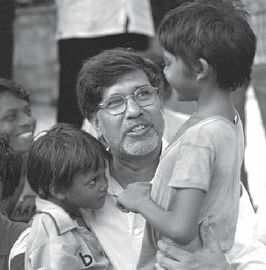 Satyarthi is the seventh Indian to win the Nobel. The prize committee “regards it as an important point for a Hindu and a Muslim, an Indian and a Pakistani, to join in a common struggle for education and against extremism”. That may sound geographically patronising, but Islamic terror and child trafficking are two critical issues which plague the world. Satyarthi won for upholding the Gandhian tradition of non-violent protest. Ironical, for the Mahatma never won the Nobel Prize. At that time, when the British and European empires ruled the world, perhaps it would have been sending the wrong signal to the natives. An acidic critic of the Swadeshi movement who even escaped assassination from anti-colonial Indians living in America, Rabindranath Tagore was honoured for being India’s cultural bridge between the East and the West. Much like Satyarthi and Malala, who are recognised as the moral bridges of conscience between cultures. In the age of no surprises, when ratings depend on which celebrity survives for how long on Bigg Boss, the Nobel Prize, too, has to be on prime time. It manages to, usually by honouring icons who are relevant to the European worldview—think Al Gore for climate change, Martin Luther King and Nelson Mandela for race rights, al-Sadat, Begin, Rabin, Arafat and Peres for peace efforts in the Middle East, Aung San Suu Kyi for democracy, Gorbachev for dismantling Communism and the Dalai Lama for his opposition to the West’s biggest bogeyman China to name a few. The truth is that their investiture confers honour on the Nobel as much as the reverse is true. Writer Jean-Paul Sartre, while refusing to accept the prize, wrote that it was “an honour awarded by cultural authorities, those of the West any more than those of the East”. The Nobel is the only thing that makes Europe and its opinion globally relevant as the continent slips into economic, racial and religious anarchy. It is a political and cultural symbol of what Europe approves of, irrespective of the eligibility of the winner. Barack Obama was nominated for the Nobel just 12 days after he moved into the White House and won it a few months later. Leo Tolstoy, Henrik Ibsen, Émile Zola and Mark Twain were rejected because their work did not conform to the social concept of European literature. Anti-Russia sentiment denied Tolstoy and Anton Chekhov the prize. The majority of Nobels has gone to Europeans—in 1974, two obscure Swedish writers Eyvind Johnson and Harry Martinson, who were also Nobel judges, were awarded, over Graham Greene, Vladimir Nabokov and Saul Bellow. The credibility of the Nobel is no longer what it was when it was conferred on Marie Curie, Alexander Fleming and CV Raman. Those were simpler times. Still, it is the world’s most prestigious prize, making its winner a star, especially in the developing world. Satyarthi’s win will bring child labour into greater focus, forcing the government to enforce existing laws relentlessly. A Nobel laureate’s voice carries an operatic resonance on the world stage. Millions of unacknowledged voices of children in the subcontinent will now be heard by the world when Malala or Satyarthi speaks. It is in such cases that the prize becomes the ultimate redemption for the man who invented dynamite. And through the Nobel prize, irony becomes salvation.